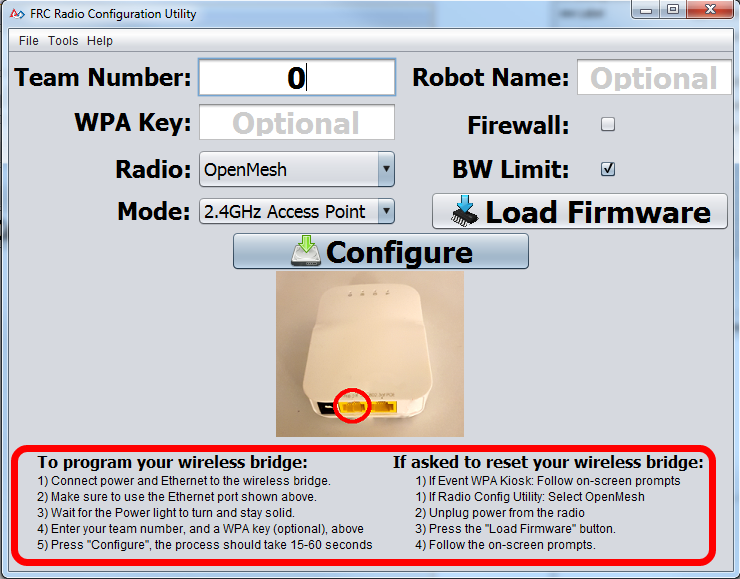 This guide will show you how to use the FRC Radio Configuration Utility software to configure your robot's wireless bridge for use outside of FRC events. Make sure no devices are connected to your computer via ethernet, other than the wireless bridge. Note that for the OM5P-AN and AC bridge, it is recommended to use a particular Ethernet port. See the on screen image and instructions for more information. The OM5P-AN and AC use the same power plug as the D-Link DAP1522, however they are 12V radios. Wire the radio to the 12V 2A terminals on the VRM (center-pin positive). Note: Teams will need to update firmware on both OM5P-AN and OM5P-AC radios in order for the programming utility to program them, or for them to be used at events. This must be done before you attempt to program them. 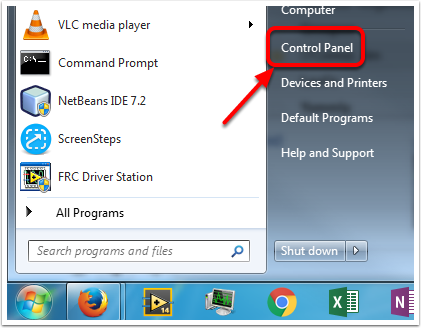 The FRC Radio Configuration Utility requires Administrator privileges to configure the network settings on your machine. The program should request the necessary privileges automatically (may require a password if run from a non-Administrator account), but if you are having trouble, try running it from an Administrator account. 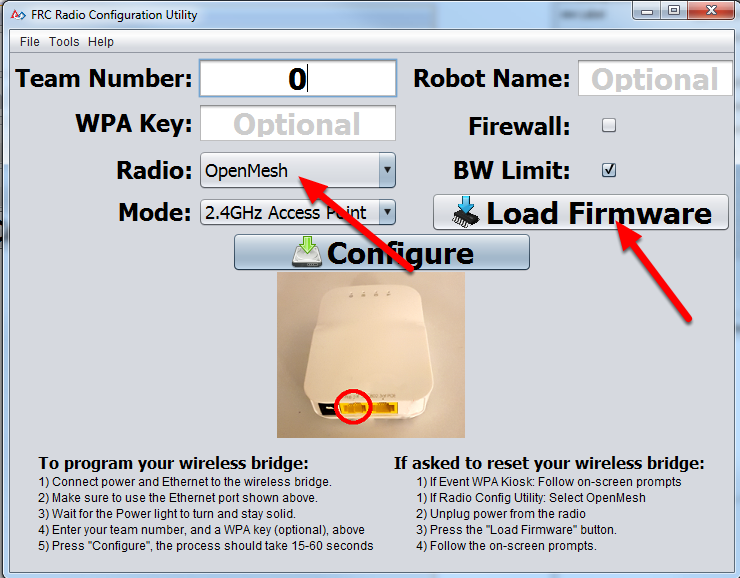 By default, the Radio Configuration Utility will program the radio to enforce the 4Mbps bandwidth limit on traffic exiting the radio over the wireless interface. In the home configuration (AP mode) this is a total, not a per client limit. This means that streaming video to multiple clients is not recommended. The Utility has been tested on Windows 7, 8 and 10. It may work on other operating systems, but has not been tested. The LED configuration noted in the graphic above. DNS server enabled. DNS server IP and domain suffix (.lan) are served as part of the DHCP. SSID may have a "Robot Name" appended to the team number to distinguish multiple networks. Note: The _IL version is for Israel teams and contains a version of the OM5PAC firmware with restricted channels for use in Israel. Version 19.1.1 corrects an issue with applying the Bandwidth Limit present in version 19.1.0. Teams should install the new version, then re-program their radio (their is no need to re-flash the firmware). 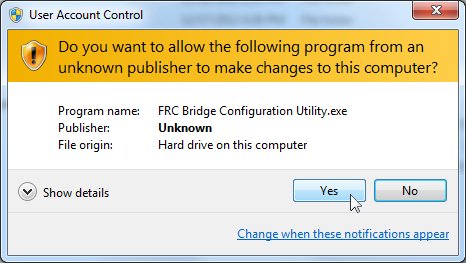 Double click on FRC_Radio_Configuration_VERSION.exe to launch the installer. Follow the prompts to complete the installation. 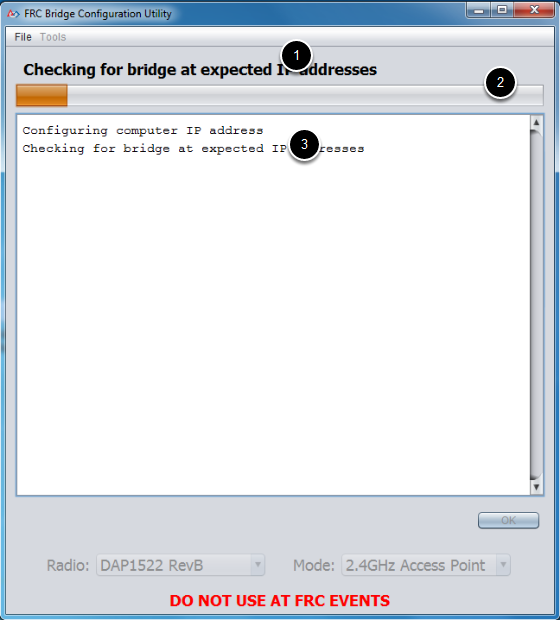 Use the pop-up window to select the which ethernet interface the configuration utility will use to communicate with the wireless bridge. 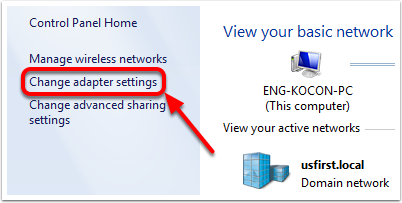 On Windows machines, ethernet interfaces are typically named "Local Area Connection". 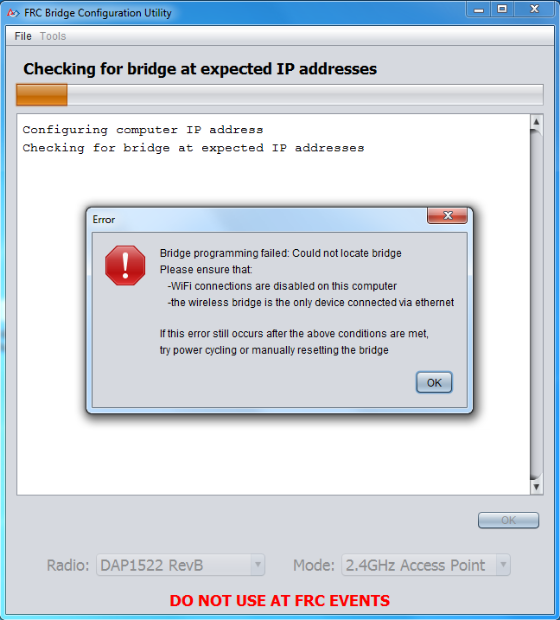 The configuration utility can not program a bridge over a wireless connection. 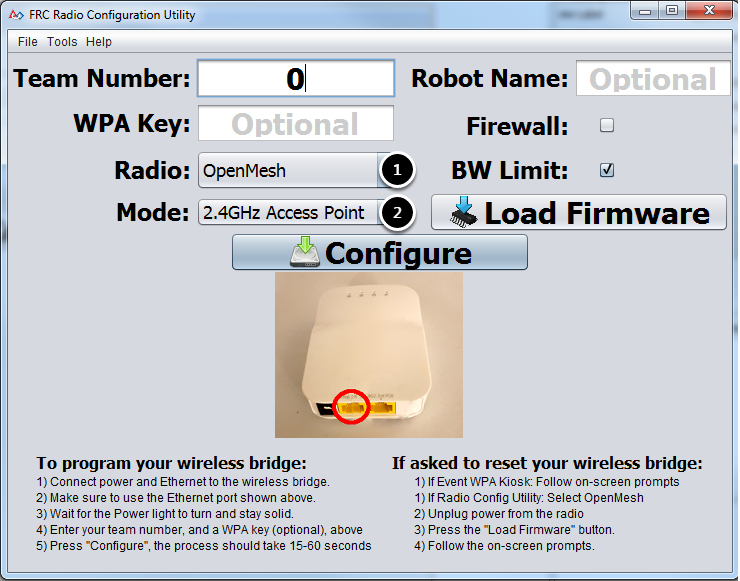 For the FRC Radio Configuration Utility to program the OM5P-AN and OM5P-AC radio, the radio must be running an FRC specific build of the OpenWRT firmware. OM5P-AC radios in the 2019 KoP should not need an update. If you do not need to update or re-load the firmware, skip the next step. Note: Radios used in 2018 will need to be updated to 2019 firmware before configuring. If you need to load the FRC firmware (or reset the radio), you can do so using the FRC Radio Configuration Utility. Follow the instructions above to install the software, launch the program and select the Ethernet interface. Make sure the OpenMesh radio is selected in the Radio dropdown. Make sure the radio is connected to the PC via Ethernet. When prompted, plug in the radio power. The software should detect the radio, load the firmware and prompt you when complete. If you see an error about NPF name, try disabling all adapters other than the one being used to program the radio. If only one adapter is found, the tool should attempt to use that one. See the steps at the bottom of this article for more info. Teams may also see this error with foreign language Operating Systems. If you experience issues loading firmware or programming on a foreign language OS, try using an English OS, such as on the KOP provided PC or setting the Locale setting to "en_us" as described on this page. Select which radio you are configuring using the drop-down list. Select which operating mode you want to configure. For most cases, the default selection of 2.4GHz Access Point will be sufficient. If your computers support it, the 5GHz AP mode is recommended, as 5GHz is less congested in many environments. Robot Name: This is a string that gets appended to the SSID used by the radio. This allows you to have multiple networks with the same team number and still be able to distinguish them. Firewall: If this box is checked, the radio firewall will be configured to attempt to mimic the port blocking behavior of the firewall present on the FRC field. For a list of open ports, please see the FRC Game Manual. BW Limit: If this box is checked, the radio enforces a 4MB/s bandwidth limit like it does when programmed at events. Note that in AP mode, this is a total limit, not per client, so streaming video to multiple clients simultaneously may cause undesired behavior. 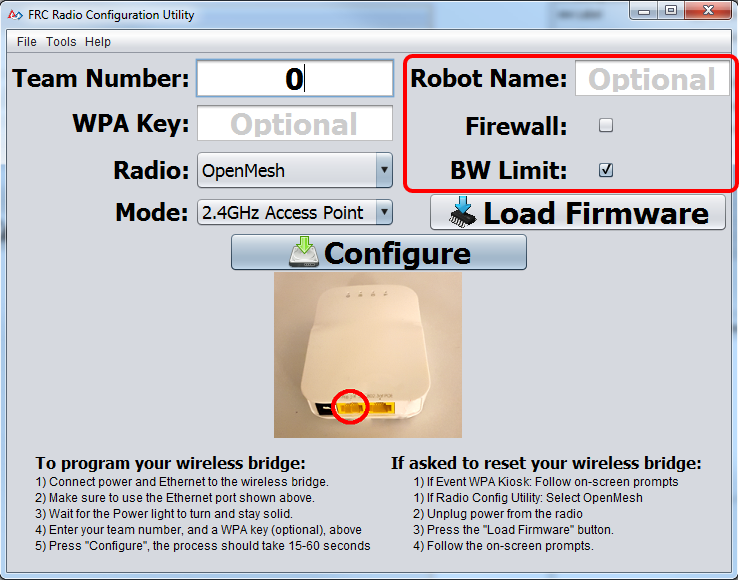 Note: Firewall and BW Limit only apply to the OpenMesh radios. These options have no effect on D-Link radios. The "Firewall" option configures the radio to emulate the field firewall. This means that you will not be able to deploy code wirelessly with this option enabled. 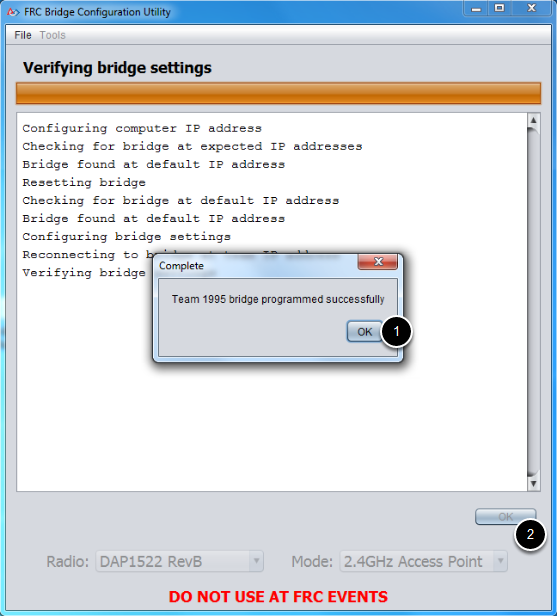 Follow the on-screen instructions for preparing your wireless bridge, entering the settings the bridge will be configured with, and starting the configuration process. These on-screen instructions update to match the bridge model and operating mode chosen. If an error occurs during the configuration process, follow the instructions in the error message to correct the problem. If you get an error message about "NPF adapter" when attempting to load firmware, you need to disable all other adapters. This is not always the same as turning the adapters off with a physical button or putting the PC into airplane mode. 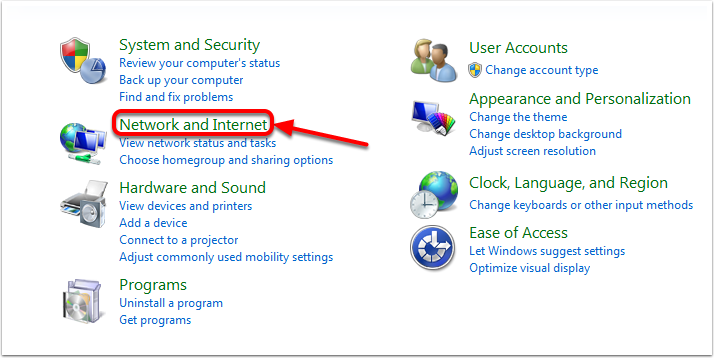 The following steps provide more detail on how to disable adapters. Choose the Network and Internet category. For each adapter other than the one connected to the radio, right click on the adapter and select Disable from the menu.